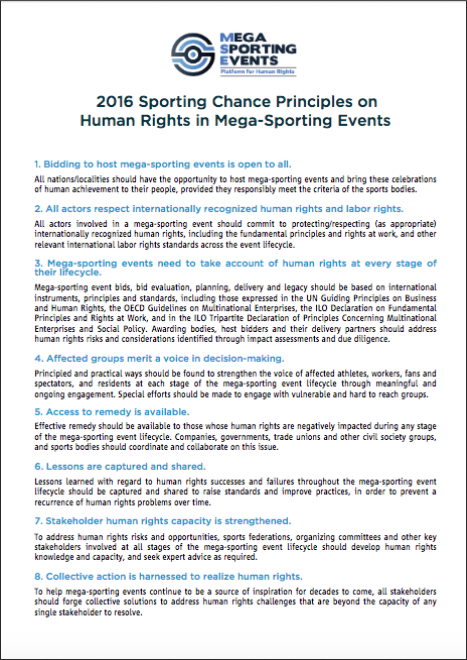 To further the efforts of the Mega-Sporting Events Platform for Human Rights (“MSE Platform”), the 2016 Sporting Chance Principles on Human Rights in Mega-Sporting Events were proposed by the U.S. Department of State, the Swiss Federal Department of Foreign Affairs and the Institute for Human Rights and Business (IHRB) in October 2016. The Principles aim to underpin the common goal of ensuring that human rights are central to mega-sporting events throughout their lifecycle. All stakeholders are invited to reference the Principles, and expressions of support or endorsement are welcome.